Aldmar. He's involved in the quest Unwanted. Commander Clyver. He'll give you the quests Built to Last and Winds of Steel. 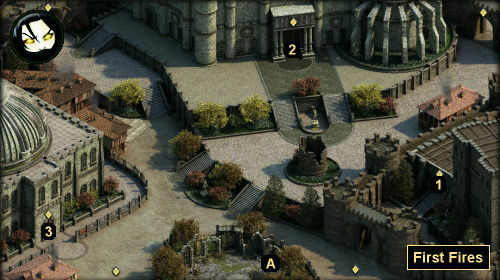 Just be aware that if you accept Winds of Steel, then you'll essentially be choosing the Crucible Knights as your faction of choice in Defiance Bay, and you won't be allowed to accept the quests The Bronze Beneath the Lake (The Dozens) or The Changing of the Guard (House Doemenel). Dunstan. He's involved in the quests The Blade of the Endless Paths and Built to Last. After completing the latter quest, Dunstan will become a shopkeeper with "exceptional" armor, Heldrik's Coat, and more in his stock. Penhelm. He's involved in the quest Rogue Knight. Wyla. She'll give you the quest Missing Sentries. The ducal palace is the site of Defiance Bay's animancy hearings, which you'll participate in during the quest The Hermit of Hadret House. You'll also meet a pair of NPCs inside: Fyrga, who will give you the quest Cinders of Faith, and the Records Keeper, who is involved in Eder's quest Fragments of a Scattered Faith. Inside the Embassy you'll meet Vicent Agosti. He'll give you the task The Forgotten, and he's also involved in Pallegina's quest The Child of Five Suns. In a back room of the embassy, you'll find an Obsidian Lamp Figurine in a locked chest. Stairs to the Temple of Woedica. These stairs will start out blocked. You'll only be able to use them after completing the quest Never Far from the Queen. To reach the Temple of Woedica before then, you'll need to find the passage leading to it in the Copperlane Catacombs.